UPDATE on March 25, 2015 Detroit Public Library Celebrates its 150th Birthday! Congratulations!! Explore the library care of the Detroit Free Press, click here. And enjoy our visit to the magnificent Main Branch below. Mission: "The Detroit Public Library enhances quality of life for the diverse and dynamic community in the city of Detroit. The Library enlightens and empowers its citizens to meet their lifelong learning needs through open and equitable access to information, technology and cultural/educational programs." Collection Size: 8.3 million "4 million government documents, 4 million books, 150,000 audio recordings, and 100,000 video recordings. The remaining 50,000 are spread across electronic databases, print and electronic subscriptions to magazines and newspapers, and the archival collections plus "museum collectibles" in the Library's Special Collections units." Collection Available Digitally: Approximately 5% of the 4 million books and approximately 1/3 of 4 million documents. On a beautiful Friday afternoon in May 2011, The Four of Us entered The Detroit Public Library's Main Branch. The Mom returned to an old favorite place; The Dad and The Sisters discovered a new favorite place. In a nutshell, this is what we learned: knowledge is power, education is freedom, which are free gifts to those who choose to use the Detroit Public Library. We were welcomed by Uzoma Onyemaechi, Assistant Director for Main Library, or "Mr. Uzo", as he invited The Sisters to call him. We explained our goals for the visit: to learn all about Detroit Public Library, about its past, present and future and to ask three questions. Question #1: What is the most interesting item held in the library's collection? After a short, thoughtful pause Uzo answered, "there is not one thing," and then lead the way to show us exactly what he meant. All along the way Uzo, an excellent guide, shared his vast knowledge of Detroit Public Library. by Timothy Oriki, the artist. We learned that many people choose to donate art to the library. While art museums charge a fee to view art, libraries are free and DPL is full of art, for free! Touring the Music and Performing Arts Department --oh, the sheet music, The Sisters were in heaven. And how about a treasure trove of record albums, 50,000? A display of the E. Azalia Hackley Collection "presented to the DPL by the Detroit Musicians Association to serve as the nucleus for a special black music collection." Over the years the collection has grown in size and scope, unmatched indeed. Upon entering the Burton Historical Collection, we were immediately drawn in as Uzo told the story of its remarkable history. The Sister's ears perked up as they heard names like Barack Obama, Laura Ingalls Wilder, and Abraham Lincoln mingled with their own. Mr. Uzo described the amazing genealogical resources to The Sisters "since your Mom and her family are from Detroit, you will find information about her, your grandparents, great grandparents. People come from all over, finding out about their families." The Burton Historical Collection is a genealogy lover's dream! Our nation's current events are also represented within the walls of the Burton Historical Collection, "President Obama was in this room," Mr. Uzo told the wide eyed Sisters. During his campaign in 2008 Obama spoke to a huge crowd if front of DPL; he chose to get ready in the Burton Historical Collection near the statue of Abraham Lincoln and Joe Biden, "the Vice President is a base ball fan," chose the Ernie Harwell Collection. No beard, beard. Which Abraham Lincoln would you vote for? And the stories continued! Periodically, "the Library of Congress sends guards here to borrow a letter to display which is a part of our collection." 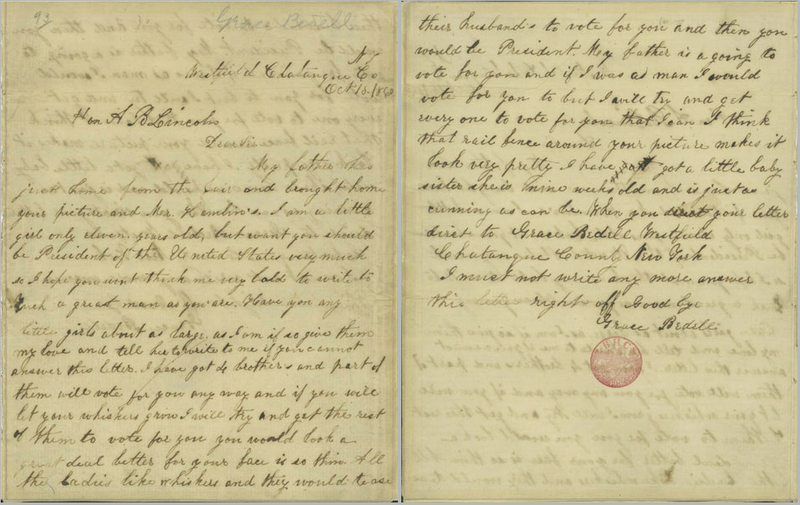 This letter, said to be worth over $1,000,000, is written by a young girl named Grace Bedell who suggested to Abraham Lincoln that he "let his whiskers grow... you would look a great deal better..." Many believe that without this letter from Grace Bedell, a beardless Abraham Lincoln may have lost the election. We learned all about Clarence Burton the man who had the vision to begin the collection so many years ago. All of the wonderful stories stopped us, for a moment transfixed, in the immense importance of what is held within the walls of the Burton Historical Collection. Grace Bedell's Letter with amazing penmanship! 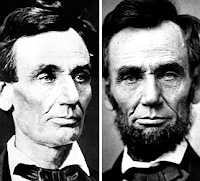 Read and view President Lincoln's response in his letter held by the Library of Congress. What is your favorite part of working with the collection? "As Coordinator for Special Collections, I'm responsible for the five collections housed at the Library: Burton, Rare Books, E. Azalia Hackley Collection of African Americans in the Performing Arts, Ernie Harwell Sports Collection, and the National Automotive History Collection. One of my favorite parts of my job is making a presentation to groups called "Bibles to Baseballs: Treasures of the Detroit Public Library's Special Collections" where I display about 50 items that document our local and national heritage. Many are singular items of cultural, historical, and literary significance: Sumerian clay cone (2100 BCE), illuminated Book of Hours (15th century), George Washington's diary, Abraham Lincoln documents, Mark Twain and Laura Ingalls Wilder manuscripts, Fisk Golden Jubilee Singers scrapbook, Motown promotional materials, carbon copy of the Tigers' purchase of Ty Cobb's contract etc. I'm extremely fortunate and honored to be the caretaker of collections of such variety and cultural richness." Do children ever come to do research? "Rarely. We did, however, have a group of Detroit fifth graders do some research from our biographical files. Each child was assigned a prominent Detroit or Michigan African American from among several categories such as business, education, politics, and religion They had to take notes or make photocopies of the material and then write a paper about that person." Do people every cry over things they find there? "One woman found her estranged father listed in the Social Security Death Benefit Index as having died two years earlier and she did quietly shed a few tears." Question #2: Why do you think libraries are an important part of a community? To us, the answer was clear by the abundant resources around each corner and on each shelf. Uzo pointed out a few highlights: the seasonal tax center where the Accounting Aid Society offers free tax preparation by volunteers. On days the tax help is offered "there are lines before the library opens and the volunteers help as many people as they are able." And then there is The Technology, Literacy, and Career Center (TLC Center) offering help with everything from finding a job to learning to read, one on one. Through the glass window we witnessed an encouraging staff member helping a middle aged man, hands hovering above keyboard, tentatively, learning. Uzo clarified how important these types of resources are, used concepts like "Digital Divide" and explained that the library gives access to information and technology that otherwise would be unavailable to many citizens. Smiling, Uzo shared a tidbit of his own story: his father encouraged him with the idea that "education is freedom". Thanks to Detroit Public Library so many people find education and freedom, including the often overlooked and under served citizens. Enter H.Y.P.E. (Helping Young People Excel) Teen Center, you must be 13-18 years old to get in on this action --we were allowed, our Tour Guide, the privilege of a quick visit to witness the magic. This is what we saw: one group of kids playing the latest music video game; others huddled over books; a stage, waiting an impromptu performance; big, flat screens a-buzz with entertainment, children clicking away on computers, learning; a room filled with the loud hush of happy kids; comfy chairs for quite reading; and adults with a watchful eyes, ready to help and provide whatever these fortunate young patrons needed. Perhaps H.Y.P.E. should stand for Happy Young People Excel. What do you do every day at H.Y.P.E.? "As the Librarian, my task is to make sure the center runs smoothly and the teens have books to read. But most importantly, I am a resource for the teens. One of my nickname's is Oneechan. That is a Japanese translation of Big Sister. I order the materials, plan programming and keep the room organized. The teens are very talented and they love sharing those things with others. So I try to plan programming that encourages those talents or helps manifest those that they don't know." Have you had an experience with a teen that stands out that you wouldn't mind sharing? "I'm very proud that many of our teens use their experience here as an amplifier for real life. There is a group of teens that meet here to practice writing music. We've let them practice and perform for the other teens here. Just yesterday, I went to their school to see them perform their pieces at the Spring Concert. I was really proud of the practice and effort that I saw them put into preparing for that moment. We have many moments like that here. Teens enjoy writing poetry and participate in our Citywide Poets program. It is very refreshing to see them get up on our stage and perform an original piece of poetry that they have written, edited, researched and now perform. These are the young people that will lead our society in the future." The HYPE stage, ready for action. What did you want to be when you were young? Did you think you'd love working in a library? "I went to Oak Park High School when I was a teenager. The library was literally across the street and I was one of those teens who did not want to be at home. I wanted to get away from my siblings and hang out with my friends so I spent a lot of time at the library. It was the people there who made the difference. It was John Martin, the Director of the library, who encouraged my love of the library, reading, and writing. I met great authors at my library like Gwendolyn Brooks and Julius Lester who encouraged me to write everyday. I fell in love with fantasy novels like the Wizard of Oz series and The Good Earth by Pearl S. Buck. When I started college, I knew I loved books so I majored in English but I remembered my days as a young person at the library and wanted to pursue it even more so that I could have a positive influence like Mr. Martin did for me." Our tour lead us all over an amazing library and everywhere we looked we wanted to know more and we didn't even begin using the library, we were just experiencing it as a place. During our visit and follow up research we spoke to several other members of DPL staff including Randolph Call, Assistant Director for Technical Services at DPL. He shared data about the library's collection and noted yet another wonderful truth: "libraries are community centers, a safe place for everyone." We'd like to thank Randolph, Mark, Steve, Janet, Oneka, Uzo and all of the staff and volunteers at Detroit Public Library. With their help we learned that libraries are so much more than just book repositories; libraries are portals through which we can visit our past and find our future; libraries are a free gift to our present, if only we learn how to use them.